Bed and books go together like bread and butter. Beds have always been a place where we relax, unwind, and release our mind and soul. Therefore, it almost goes without saying that our beds will act as a cosy and comfortable place to sit back and enjoy a good book. Beds and books are ageless, from small children hidden under covers reading fantasy novels with a torch to adults refreshing themselves for a long day ahead; sleeping spaces and reading materials are a tried and tested combination. However, our books tend to reside within living rooms rather than bedrooms. They are stacked up around sofas, sitting on side tables, and rarely do we decide to include a bookshelf in the bedroom. Instead of housing all of your books in the living quarters of your dwelling how about investing in some solid shelf space in your bedroom? 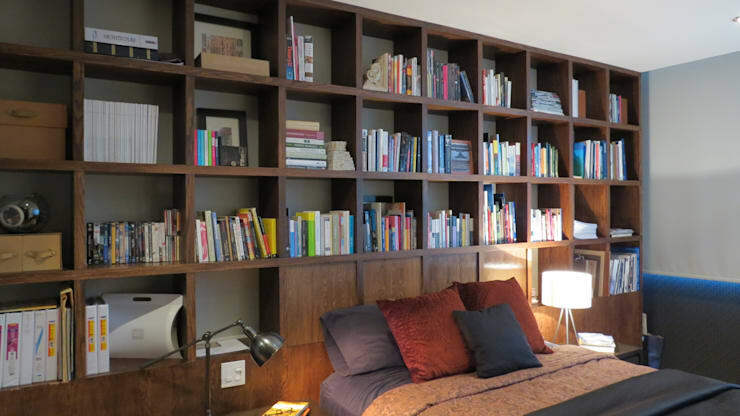 Today on homify we are paying homage to this timeless partnership with a collection of beds with bookshelves. From contemporary under bed storage, to kids' bunks replete with all the bells and whistles, we have something you'll love! Check out the interesting and unique examples below and transform your bedroom to include a little convenient literature space. First things first we are taking a look at the ultimate space saving bookshelf-bed combination. Ideally manufactured to make the most out of the bedroom space, this gorgeous combination of bed and shelf utilises the base of the bed (a normally vacant space) to provide handy access to the occupant's books and other ornaments. 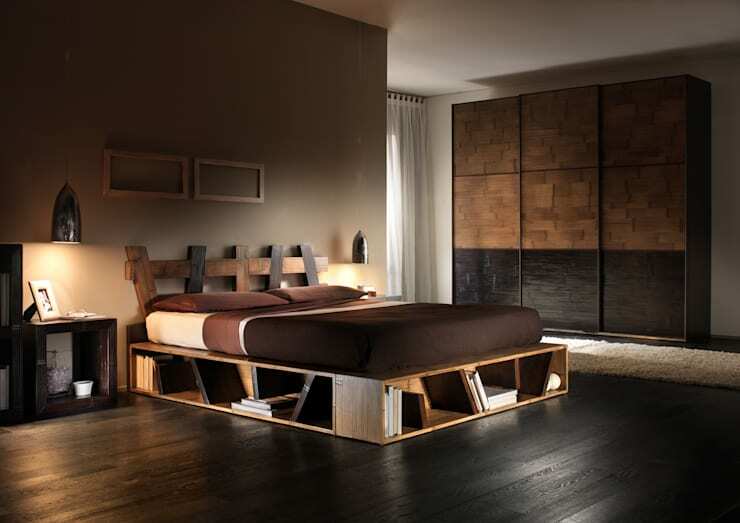 Constructed from timber, this bed is unique and intriguing, working wonderfully with the darker colour scheme and the black floorboards. This bed might have some drawbacks however; the quilt must be tucked in to ensure the books are easily accessible, while the spaces may catch dust if not regularly cleaned. How about a fabulous bed head? When it comes to stylish design, this bed and bookshelf combination has it in spades. Elegant, chic, understated, yet still eye-catching, this low bed and shelf wall is the epitome of cool. 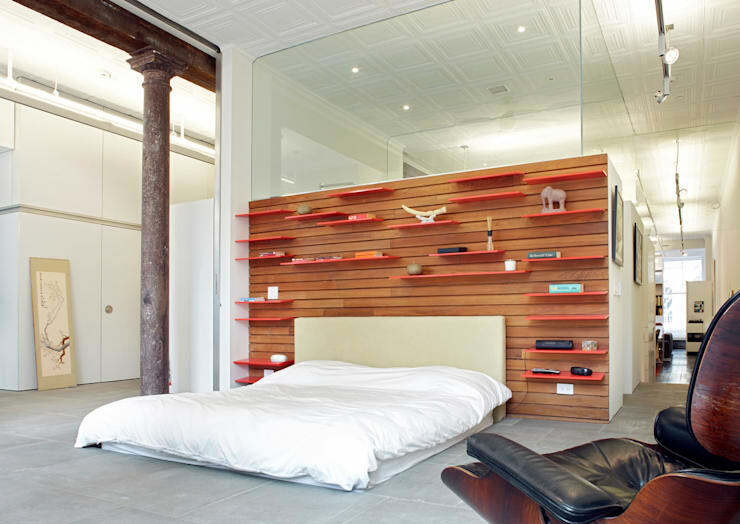 The shelves jut out from the wall as if they are installed into a pegboard, while the bed stills within these shelves looking nonchalant and minimalist. This apartment is a fabulous example of chic design, and works wonders within the eclectic and minimal ambience of the space. Next up we are taking a look at a kid's bed. Children's beds are often tricky to design as they grow quite quickly, and their needs change even faster. However, this design we are looking at is quite the opposite. Perfect for many different ages, yet still ultra-stylish, the bed is a beautiful combination of elements. This bright colour-blocked design is a fabulous all-in-one piece of furniture that utilises its space effortlessly. Perfect for apartment living, the bed houses another trundle bed underneath itself, and a bookshelf at the end. Additionally, and for extra storage space, this bed has a closet to the right, and extra cupboards above. This is truly a multi-purpose space fit for the most stylish of children and teens. Who said cardboard could be furniture? These days we are seeing more and more wonderful designs from the most unlikely of sources. Enter the cardboard bedroom. This room is constructed to hold a queensize mattress, and comes with a range of modifiable cardboard cubes that can hold books, ornaments, and any other bedroom accessories you can think of. The colour scheme in this room has been designed beautifully to embrace the neutral brown hue of the cardboard. Blue walls evoke a sense of intellectual serenity, and are paired with bursts of yellow and black to add playfulness. Designing a room for a teenager is no easy feat, the require workspaces, more room for clothing, and a range of different accessories that child do not. Even harder is designing a room for two teenagers! Luckily we have found the perfect example. Similar to the child's trundle bed in the aforementioned example, this bunk bed is suited to children who are slightly older. 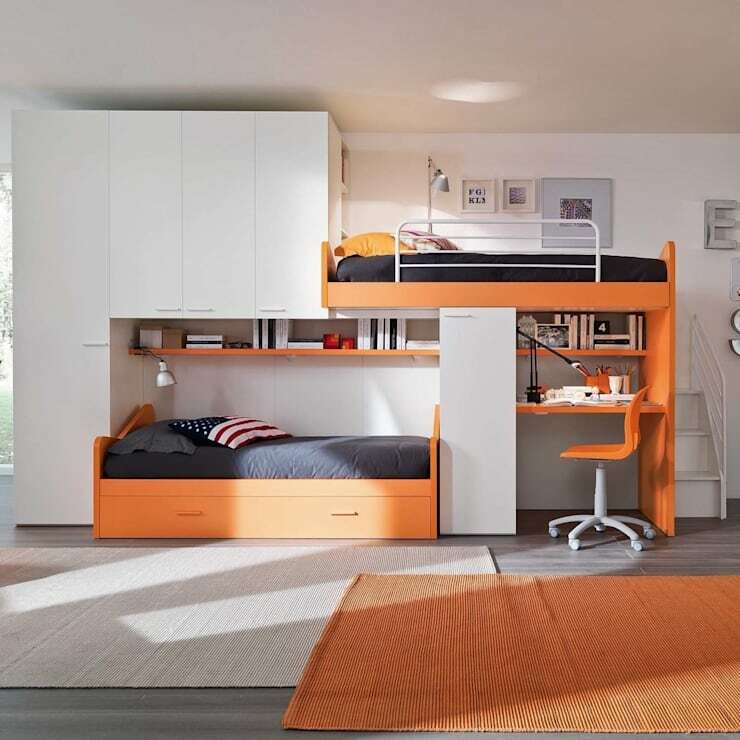 Perfect for a teenager, this impressive combination of bed and workspace is delightful and well-designed. Storage sits to the left of the beds and provides ample room for clothing, toys, and school paraphernalia, while there is a nifty bookshelf built in above the lower bed. When one bookshelf isn't enough, why not install a whole wall of books! Here in this example we see a fabulous bed head replete with an array of floor to ceiling shelves. If you are someone who loves to read in bed, then this is the design you've been looking for. The colour scheme for the room is a combination of contrasts and looks brilliant when put together. The light white walls work perfectly against the dark timber of the bookshelves, and when paired with the sumptuous bedding, create an idyllic book-lovers heaven. If you are considering some bespoke joinery or cabinetry for your home, chat to a professional to ensure your dreams are expertly realised! Finally we are taking a peek at this unbelievable bed and bookshelf combination. Before we even begin look at the bookshelf the bed catching our eye with its amazing shape and form. 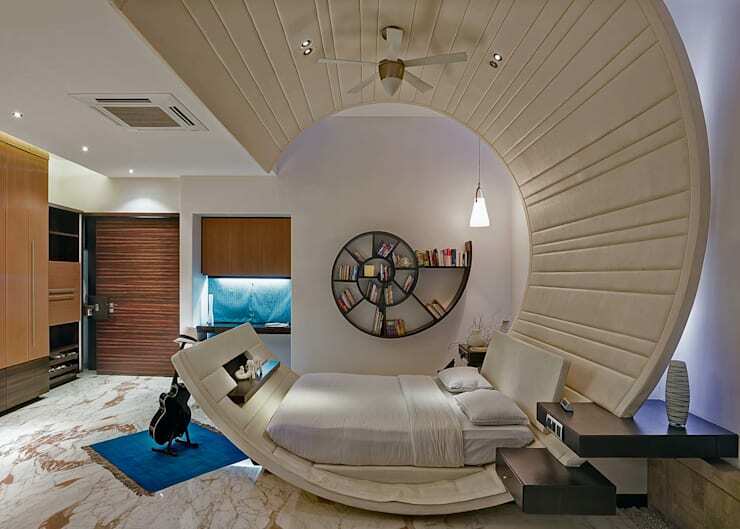 The circular bed is shell like in its design and this is reiterated with the snail-like bookshelf. Ideally positioned to provide the occupant with easy access to the books, this visual partnership is wonderfully engaging and exciting. The unwinding shape of the bed is ideal as it imparts a sense of unwinding energy, brilliant for a space of rest and relaxation.